Workforce performance of the system would be best when we have the most appropriate person, in terms of both skills and motivation, for the right job in the right place, working within the right professional and incentive environment. Attracting and Retaining Doctors in Remote Areas– The Policy proposes financial and non-financial incentives, creating medical colleges in rural areas; preference to students from under-serviced areas, realigning pedagogy and curriculum to suit rural health needs, mandatory rural postings, etc. Measures of compulsion- through mandatory rotational postings dovetailed with clear and transparent career progression guidelines are valuable strategies. A constant effort, therefore, needs to be made to increase the capacity of the public health systems to absorb and retain the manpower. The total sanctioned posts of doctors in the public sector should increase to ensure availability of doctors corresponding to the accepted norms. Exact package of policy measures would vary from State to State and would change over time. Specialist Attraction and Retention– Proposed policy measures include – recognition of educational options linked with National Board of Examination & College of Physicians and Surgeons, creation of specialist cadre with suitable pay scale, up-gradation of short term training to medical officers to provide basic specialist services at the block and district level, performance linked payments and popularise MD (Doctor of Medicine) course in Family Medicine or General Practice. The policy recommends that the National Board of Examinations should expand the post graduate training up to the district level. The policy recommends creation of a large number of distance and continuing education options for general practitioners in both the private and the public sectors, which would upgrade their skills to manage the large majority of cases at local level, thus avoiding unnecessary referrals. Mid-Level Service Providers: For expansion of primary care from selective care to comprehensive care, complementary human resource strategy is the development of a cadre of mid-level care providers. This can be done through appropriate courses like a B.Sc. in community health and/or through competency-based bridge courses and short courses. These bridge courses could admit graduates from different clinical and paramedical backgrounds like AYUSH doctors, B.Sc. Nurses, Pharmacists, GNMs, etc and equip them with skills to provide services at the sub-centre and other peripheral levels. Locale based selection, a special curriculum of training close to the place where they live and work, conditional licensing, enabling legal framework and a positive practice environment will ensure that this new cadre is preferentially available where they are needed most, i.e. in the under-served areas. Nursing/Paramedical – The policy also talks about addressing the acute shortage of nursing and paramedical professionals in the country. The Policy talks about establishing nursing school in every large district or cluster of districts of about 20 to 30 lakh population and establishing Centers of Excellence for Nursing and Allied Health Sciences in each State. For paramedical, Training courses and curriculum for super specialty paramedical care (perfusionists, physiotherapists, occupational therapists, radiological technicians, audiologists, MRI technicians, etc.) would be developed. This policy also supports certification programme for ASHAs for their preferential selection into ANM, nursing and paramedical courses. Human Resource Governance and leadership development: The policy recognizes that human resource management is critical to health system strengthening and healthcare delivery and therefore the policy supports measures aimed at continuing medical and nursing education and on the job support to providers, especially those working in professional isolation in rural areas using digital tools and other appropriate training resources. 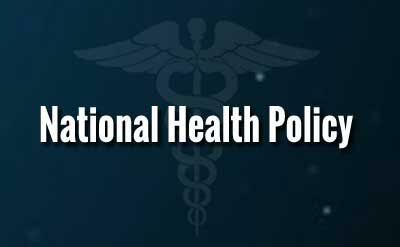 Policy recommends development of leadership skills, strengthening human resource governance in public health system, through establishment of robust recruitment, selection, promotion and transfer postings policies. If we get govt job means we can leave bridge course for c.h.ns or we have to pay money for bond breaking. Can a physiotherapist do bridge course? It is a right step which will help the rural people to get the better treatment at the village level. Many schemes were launched since long to help the ailing humanity but because of opposition from some sections of the medical fraternity it failed to bring out the required results. Multipurpose scheme launched to give the health services at the sub center level could not be implemented because of MCI which did not permit anyone to examine the patient other than a medical graduate . Pharmacists since long have been giving services to the patients in the absence of doctors are not given any legal right to do so .our country does not have any arrangement to give health services at the village level and will fail to do so in the coming future if it does not give any right to paramedical to participate in it. Let they may be called PHARMACIST PRACTITIONER , NURSE PRACTITIONER AND SO ON . Secondly to give right to AYUSH PRACTITIONERS TO use modern medicines will make qualified persons who have studied all the subjects available to the public simply by giving them proper knowledge of modern pharmacology . Every medical graduate should be imparted scientific knowledge of modern drugs along with their respective pharmacology . Medical science should be used to serve the humanity and it should be left to the discretion of medical graduate to decide . what a shame that a medical graduate of homeopathy who have studied surgery as a full subject is legally not allowed to stitch a wound because he can not use the required local anesthesia being a modern medicine . let the new bridge course be implemented for paramedical and Ayush doctors to help the ailing humanity . Central govt concept very good . Rural.and remote people are welcoming..There is big revolutionary changes in medical services in our india.mbbs bhms bams courses syllabus are equal ..Why discrimination..impliment immediately national health police …. I always see people fighting against different Pathy\’s.I cant understand why are we fighting.Each system has there own specialties.Each one of us dont know what other pathy people study in detail.Lets leave the decision on the policy makers because there are more qualified Doctors in the panel who is looking into the policy.I think more qualified then the friend who was abusing 1 system in below comments!I feel all medical courses like MBBS,BAMS,BHMS do teach Anatomy,Physiology,Biochemistry,Pharmacology (Respective speciality),Medicine,Surgery,obg and Gynecology and other clinical subjects including Forensic Medicine.Courses are well designed by the experts.Indian situation needs more doctors so just by teaching a bridge course of Modern pharmacology every system will become equally qualified and provide there services in our country where the medical facilities are still not available in many areas.Believe me i know few places where people travel minimum 100 KM to reach out to a doctor. Friends please dont get scared if somebody will start practicing modern medicine after reading the subjects will not take your patients its your skill which will get you job,patients,money.And moreover i have seen people starts caring about medical system suddenly by saying it will kill patients.I have seen many corporate hospitals take Indian system of medicine doctor in there hospitals with high salary. I think this is a good move by govt to help public.Those who criticize this i think they are not aware of other system of medicine.Please look forward to help people.I know many doctors of indian medicine who is helping people in many PHC\’s.Course wise all pathy are same only Modern pharmacology was missing in other system which govt is incorporating.Really speaking if this would have been done 15 years back i would have not landed in doing 2 degree BHMS and then MBBS only for learning Modern Pharmacology because whatever else they tought during my MBBS (In a very reputed college in Delhi) was just a refresher course for me as i read all those topics in BHMS.So friends please stop abusing each other and get prepared for new role for helping Patients.